Cinefex Magazine is honoring the magnificent work of Industrial Light & Magic in their upcoming February issue. The cover(above) features the Millennium Falcon chased by TIE Fighters above the surface of Jakku as seen in The Force Awakens. The magazine will be covering ILM's work in the seventh installment of the saga, as well as other recent films such as Ex Machina, Spectre, The Finest Hours and The Revenant. It's certain to be a fascinating read, and a great collector's item(that cover is stunning!). 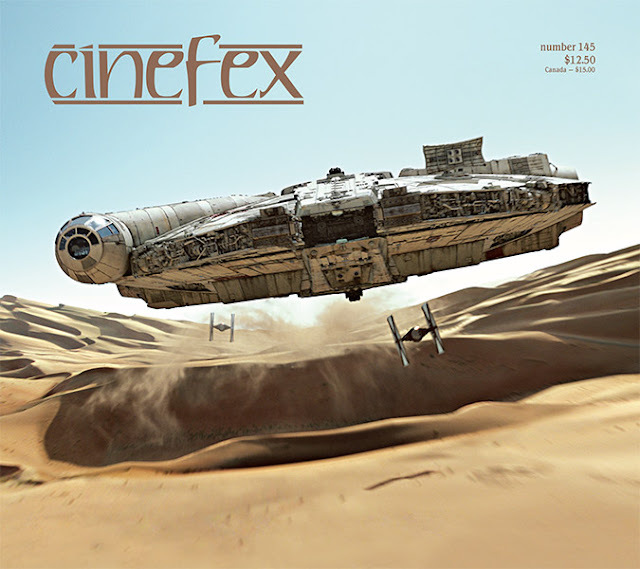 You can click here to preorder your copy of Cinefex Magazine, or simply be on the lookout for the new issue when it hits newsstands next month! I am on the same page with http://pimion.com/write-essay/: Star Wars movie has been the one to get Oscar Award for visual effects. I want the Millennium Falcon to my collection!